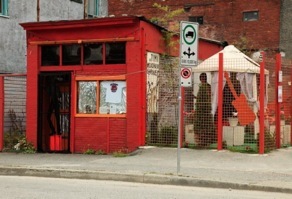 Source: vancitybuzz.com, accessed 14 December 2012. Earlier this semester, I flashed a photo of rock icon Jimi Hendrix up on the screen during a class on settler colonialism. It was a bit over the top but I was trying to get my students to think of connections as well as divides, and Hendrix’s part-Cherokee heritage seemed like a good way of driving home the point. What I missed completely, from my perch as a scholar-in-transit at UBC, was that Hendrix’s story would have been much more effective in a talk about the crafting of local history. What I didn’t realize, when I used his image in class, was that Hendrix had ties to Vancouver. Thanks to the efforts of a lone individual, this history has not been forgotten. In fact, it is being recovered by hundreds of visitors who, like me, find themselves staring at the incongruous presence of a Jimi Hendrix Shrine on the edge of the Vancouver’s historic Chinatown district. The shrine’s official-sounding address, 796 Main Street, is somewhat misleading. The Jimi Hendrix Shrine, which opened in 2008, is actually located in a non-descript shack-like structure that spills over into an adjoining yard. The red building that houses the shrine was once Vie’s Chicken Inn where Norah Rose Moore Hendrix, Jimi’s grandmother, cooked for many years. She moved to Vancouver from Knoxville, Tennessee in 1911. Jimi used to come up from Seattle to visit his grandmother, spending whole summers in Vancouver. Local lore claims that he used to play at Vie’s after hours. The shrine features images of Jimi Hendrix and historic Vancouver. Its contents and its presence are evidence of the changes that have taken place in this polyglot of a neighbourhood. The shrine’s website notes that it sits in what was once “the only black neighborhood in Vancouver, BC, Canada.” It is here that the shrine becomes a particularly insightful portal into the history of the city. While Jimi’s presence and that of his grandmother hint at the history of movement, mobility and entangled relations in the city, the location of the shrine also informs visitors about the history of urban renewal in the city. The disappearance of Hogan’s Alley and the current threats to the shrine’s site speak to this contested history. Hogan’s Alley, the unofficial name for Park Lance, once bordered the neighbourhoods of Chinatown and Strathcona. From the late nineteenth century, Chinatown was the business and residential hub for Chinese residents of the city. Over the years, Chinatown became more of a commercial hub and many residents moved to nearby Strathcona, which eventually became one of the most diverse parts of Vancouver. After the Second World War, Strathcona flourished with a mix of migrants from Europe and new migration from Asia. The neighboorhood drew people newly arrived to the city, yet Vancouver City Council did not always appreciate the community spirit that this dynamic generated. Strathcona and Chinatown were almost destroyed in the 1950s as a result of urban renewal plans that would have replaced family dwellings with a series of identical apartment blocks. It was threatened again in the 1960s when council proposal to put a freeway through their very core. They survived as a result of intense community activism. Hogan’s Alley did not. It was destroyed in 1972 when the city built the Georgia viaduct that still runs through the area. The Jimi Hendrix Shrine is tucked up against this viaduct. Now that I have discovered the shrine, I don’t want Vancouver to lose it. There is something quite amazing about an Italian émigré who buys a property, discovers it is connected to a rock legend and then dedicates time, energy and passion to commemorating the musician, the place he was once connected to and the entertainment district that was Hogan’s Alley. The shrine and its history offer many teachable moments. I hope they survive the test of time. *Admission to the shrine is free. It is open from June to September, 1:00 pm – 6:00 pm (Monday – Saturday) but there is lots to see from the outside, year-round. Laura Madokoro is saying goodbye to Vancouver and moving on to pursue a SSHRC Postdoctoral Fellowship at Columbia University. Two questions: what did you (the author) intend by flashing Jimi Hendrix’s picture up during a course on settler colonialism? What did you learn upon seeing and learning about the shrine to Hendrix about the settler colonialism?